After Opening: Consume as soon as possible. Ingredients: Green Chive, Mungbean Sprout, Oyster Mushroom, Dried Sweet Potato Stalk, Beef Extract, Beef Bone Extract, Soybean Paste (Soy, Wheat), Maltodextrin, Oak Mushroom Extract Powder, Garlic Powder). 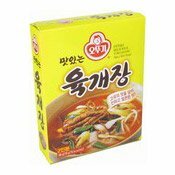 Simply enter your details below and we will send you an e-mail when “Instant Yukgaejang Spicy Beef Soup (韓國牛肉湯料)” is back in stock!